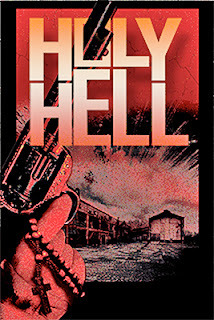 Indican Pictures Tabs Christmas Day For The DVD Debut Of Writer/Director Ryan LaPlante’s Holy Hell! 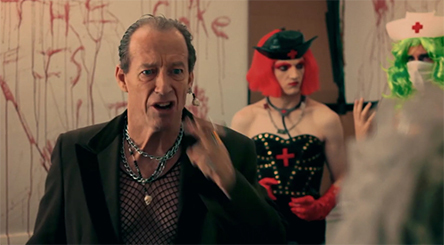 Indican Pictures announced this past week that writer/director Ryan LaPlante’s totally insane, hilarious, offensive and very inappropriate grindhouse bloodbath, Holy Hell!, will be making its DVD debut on Dec. 25. This genre gem — produced on a micro budget by LaPlante’s Rogues Gallery Productions — worked the festival circuit for two solid years beginning in the summer of 2015, wracking up Best Picture laurels at such venues as the Action on Film International Film Festival (AOF), Buffalo Dreams Fantastic Film Festival, the FANtastic Horror Film Festival in San Diego, the San Antonio Horrific Film Festival and more. Reviews were terrific, festival fans raved about Holy Hell!, but at some point the film had to find a wider audience … enter Indican Pictures. They took the film out on a very limited theatrical break in July in order to generated additional buzz! And now the DVD release that genre fans have been waiting for is “gift wrapped” for Christmas! For the record, the ARR works out to 158 days. Father Augustus Bane (played by LaPlante — a professional “voice talent” by trade with such credits as Jerry and the Raiders, Odd Squad, Extreme Babysitting, etc.) is a bottom-of-the-barrel preacher who ministers those way, way, way down on their luck. It is during one of these home intervention sessions with the Bonner family — it seems that the daughter, Amy Bonner (Alysa King — Berkshire County (aka: Tormented), Dead Rivalry, Lady Psycho Killer), is drinking too much, swearing too much and flaunting her “assets” for all to see — that the evil MacFarlane clan elects to stage an ultra-violent home “intervention” of their own and torture and then murder everyone in the place. Now that would be the end of the film, but thankfully Father Bane survived the carnage as did, as luck would have it, one of his parishioners. This would be the alluring Amy, the young woman who drinks too much, swears too much and is whacked-out sexually. It’s a hell of team, a trigger-happy preacher and the only surviving family member of the Bonner massacre, Amy. Together, they set out to bring the MacFarlanes — lead by Dokes (Michael Rawley) and ably assisted by his demented children, “Sissy” (Shane Patrick McClurg), the blood-sucking Trisha (Rachel Ann Little) and Buddy (Reece Presley) — to divine justice! Once the retribution begins — a faith-based pistol as Bane’s messenger of vengeance — and Dokes learns that two of his beloved children have been dispatch by the good preacher all bets are off! 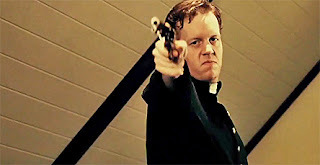 El Diablo (Austin Schaefer), a killer even crazier than Dokes and his clan, is summoned to rid the world of Father Bane and his only disciple, Amy. It is all out war; a bloodbath of epic proportions! Does good prevail? Christmas Day and the DVD debut of Holy Hell! holds the answer for those summoned to the call of Father Bane! Labels: Indican Pictures Tabs Christmas Day For The DVD Debut Of Writer/Director Ryan LaPlante’s Holy Hell! News arrived this past week that Icarus Films will be quick to expand its January of 2019 home entertainment release slate with the arrival of two additional DVD releases on Jan. 15. Icarus Film will be teaming with both Bullfrog Films for the debut of French documentary filmmakers by Nathanaël Coste and Marc de la Ménardière’s globetrotting odyssey, A Quest for Meaning, and Frances elite Distrib Films for director Thomas Lilti’s Hippocrates: Diary of a French Doctor. They will be joining last week’s Jan. 8 first-of-the-New Year DVD product offerings from Icarus Films and Bullfrog Films, documentary filmmaker John Feldman’s Symbiotic Earth, an intimate look at the life and theories of evolutionary theories of the late Professor Lynn Margulis. There is hope when you see that young professionals from other cultures — in this case, France — are struck by how destructive the digital world and 24/7 connectivity has become. It’s an addiction; an itch you can quite seem to scratch … a form of societal anxiety. This is what childhood friends, Nathanaël Coste (who serves as narrator) and Marc de la Ménardière (who does most of the camera work), have come to recognize and take to the road in search of, if not answers, at least a better understanding of why their career paths are not fulfilling. Their film breaks down into four elements. The first is the recognition that there is a problem with the social bond … anxiety and disconnection; an alienation brought on, ironically, by an over-connected world. Too much … a uneasy feeling that simple might be better. Once Nathanaël and Marc outline their concerns, the second element emerges, a look at the globalist structure of competition. There are no easy answers, just a sense that something is very wrong. Next is the unique French concept expressed by the filmmakers in their travels, “Altermondialisme,” which has mutated into the English language term, Alter-globalization. Generally speaking, globalism has become a runaway train … slowdown, keep the good aspects, but the ecology and human values need to be recognized. And finally, the fourth element of A Quest for Meaning is a call to reconnect to the earth around us … to once again respect the environment and a return to the basics. Filmmakers Nathanaël Coste and Marc de la Ménardière take to the road to explore these questions … Europe, India and South America are stops along their quest. They may not have the answers, but they do recognize the problem — that itch that the collective “we” can’t seem to scratch — and raise issues that are worthy of discussion. 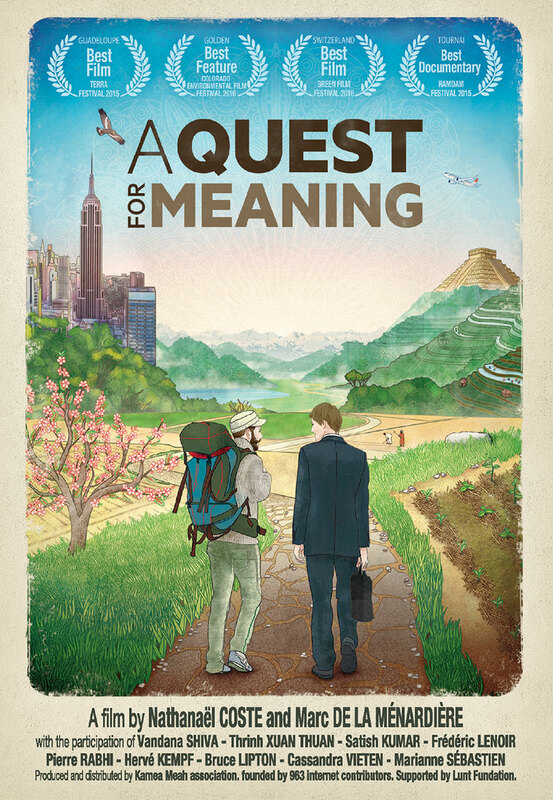 A Quest for Meaning is a road trip on DVD that is well worth taking. A Quest for Meaning is presented in French with English and includes English subtitles where necessary. Included with the documentary is the short film titled Ego Not Bad, which focuses on author and philosopher Arnaud Desjardins. 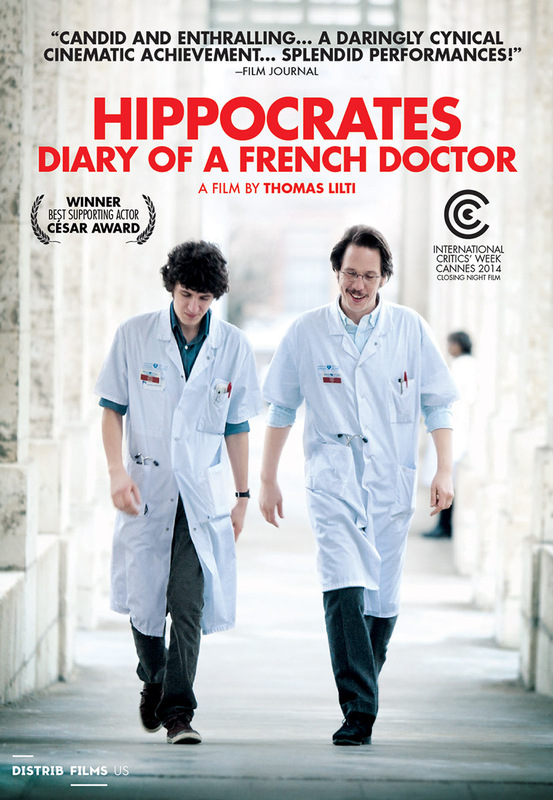 Also making its domestic DVD debut on Jan. 15 is French filmmaker Thomas Lilti’s 2014 César Awards Best Picture nominee (seven total nominations, including Best Original Screenplay and Best Director, plus a win for Best Supporting Actor, Reda Kateb), Hippocrates: Diary of a French Doctor. Lilti’s film made its debut at the Cannes Film Festival in 2014, worked the international film festival circuit and had a brief arthouse run domestically in 2015 … and then disappeared. 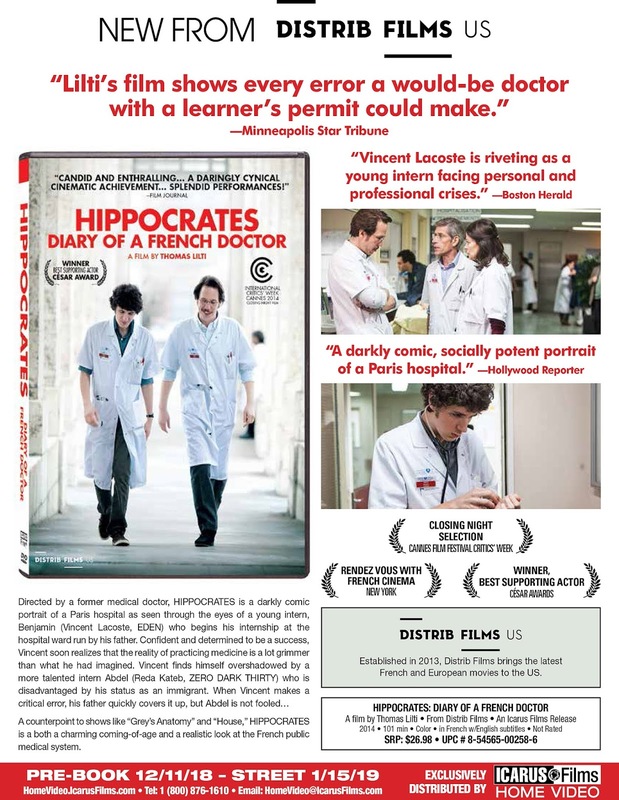 The distribution arrangement that Icarus Films has with France’s Distrib Films finally brings Hippocrates: Diary of a French Doctor to the domestic home entertainment marketplace … long overdue. 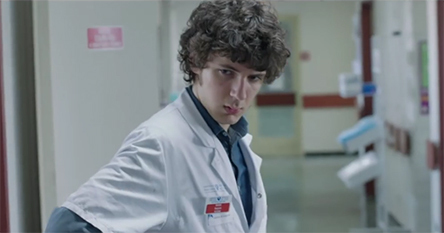 Benjamin (Vincent Lacoste — three-time César Awards acting nominee: Victoria, Hippocrates: Diary of a French Doctor and The French Kissers) is to follow in his father’s footsteps and become a doctor. We pick up his story as intern at Hôpital Rothschild in Paris, where his father is one of the high-ranking physicians … he has a leg-up, so to speak. But things head south when he bungles the diagnosis of a patient’s stomach pains — a decision to forego an EKG examine — and death ensues. It’s not that cut and dried for Benjamin, as the patient had a history of being in and out of the hospital on a regular (chronic alcoholism) and resources were stretched thin (equipment issues). The powers that be unite to cover up for him, which sets in motion a series of events featuring the patient’s ex-wife (played by Julie Brochen) and Benjamin’s need to step up his game — which, in fact, he may not be capable of. The inner-workings of the hospital (that stuff behind the curtain) are explored in connection with this “dramatic event” and the plight of a far superior “intern,” Abdel (Reda Kateb), who is actually an Algerian doctor, but is relegated to grunt work because of being French, but not being really French. Filmmaker Thomas Lilti, a former physician himself, brings a sense of realism to the proceedings that makes Hippocrates: Diary of a French Doctor more than just a dramatic tale, but something of an indictment of the current state of France’s medical care environment. Let’s have some fun on Jan 22 … make that a bloody good time instead of just plain old fun! That’s what Wild Eye Releasing, with sales and distribution expertise provided by MVD Entertainment Group, has in store for genre fans in the New Year with the DVD debut of director Steve Rudzinski’s CarousHELL. 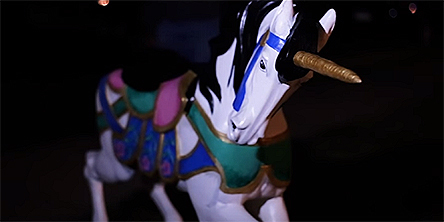 Duke is a unicorn, dashing, handsome and with just one view of the world — the world he sees from his position as one of the rides on a carousel … over and over and over again! It is a thankless job; a messy job (kids are gruesome and careless) … and in something of an intro, Duke (voiced by Steve Rimpici — The Puppet Monster Massacre, Easter Casket, Project London, etc. ), lets the audience know that he’s up to his proverbial unicorn with the insults. The last straw comes one day when a kid nicknamed “Lunchbox” (Teague Shaw) hops on his back and pushes Duke over the edge. Kill is the mission and the path to that is easy enough, simply follow the dopey kid’s big sister, Laurie (Se’ Marie — Cryptids, Career Opportunities in Organized Crime) back to their home and have it! CarousHELL is unlike any other merry-go-round horror flick you’ve ever seen as Duke uncouples himself (itself?) from the daily torments of the round circle and sets off to mop the halls with “Lunchbox” and anyone who gets in the way. To be sure, plenty of hapless fools get in the way of this killing machine during an evening of hopalong madness. Filmmaker Steve Rudzinski (Everyone Must Die!, Captain Z & the Terror of Leviathan, Red Christmas, etc.) joins in the fun as a pizza delivery guy who has one hell of a time getting paid. And it’s not all kill, kill, kill for Duke as he does come across a willing woman with a unicorn fetish! 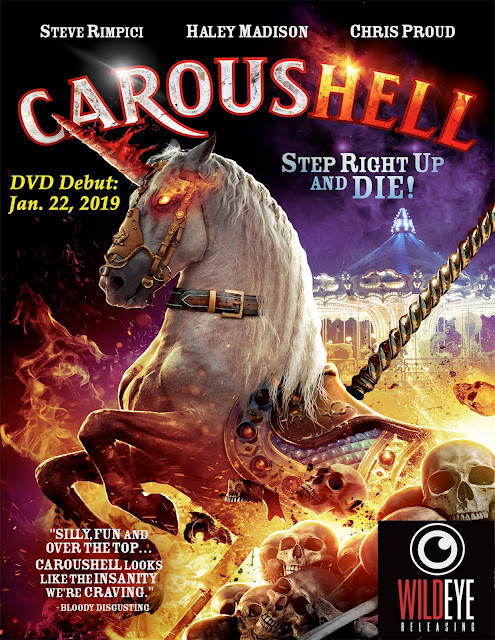 As to bonus goodies, CarousHELL includes commentary from Steve Rudzinski, a blooper reel, deleted scenes, a behind-the-scenes video session and more! MVD Entertainment Group announced its first Marquee Collection status title this past week. Set to arrive on Blu-ray for the first time on Jan. 22 will be director Howard Deutch’s 1994 comedy, Getting Even With Dad, teaming Macaulay Culkin with Ted Danson. Ted Danson had just wrapped his decade-long run as Sam Malone in Cheers and returned to the big screen for another crack at a hit comedy — during his Cheers run he starred in both 3 Men and a Baby (1987) and 3 Men and a Little Lady (1990) — and landed this against-character role in Howard Deutch’s follow-up to Pretty in Pink (1986), Some Kind of Wonderful (1987) and The Great Outdoors (1988). Enter Macaulay Culkin, who was making the transition from child star — Home Alone (1990) and Home Alone 2 (1992) — to teenager, rebellious teenager at that (out of the view of the public at the time was a rapidly deteriorating relationship with his father). 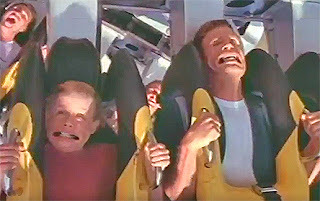 The critics savaged the film at the time, because they didn’t get what they expected. 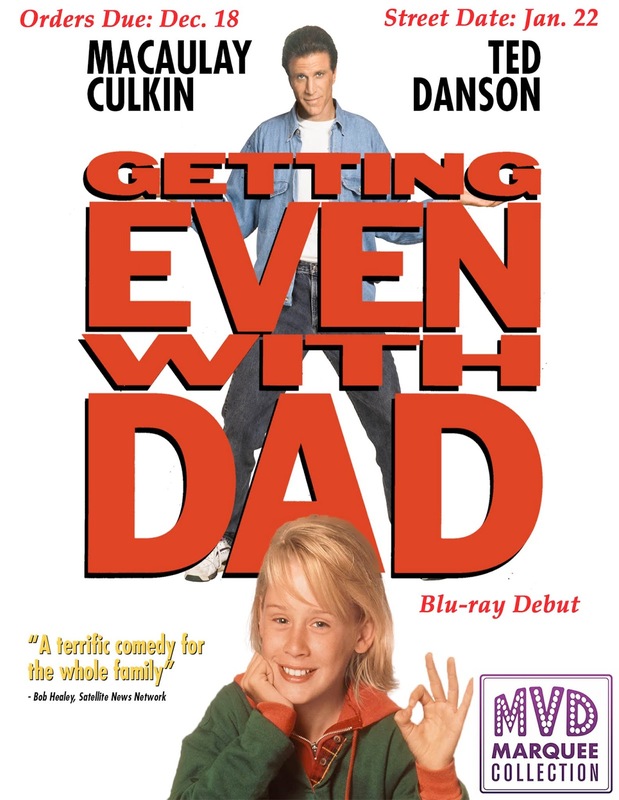 Time and distance has made Getting Even With Dad a far more interesting comedy, especially when you take into consideration where everyone involved was coming from at the time. The backbone of the story has a sullen Culkin, being left with his ex-con father (Danson), while the aunt (played by Kathleen Wilhoite) who raised him — following his mother’s death — is off on her honeymoon. Unknown to both aunt and son is that dear old dad is planning a heist with cohorts Bobby (Saul Rubinek) and Carl (Gailard Sartain) and has no time for the son he hardly knows (time in prison will do that). In any case, the heist goes off as planned (a stash of rare coins), but Culkin throws a monkey wrench into the works by hiding the loot and demanding some father-son time. 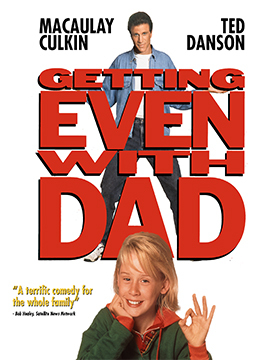 The bulk of the film’s running time is Culkin twisting in the knife ever deeper with more and more outrageous demands. Bonus features included with this Marquee Collection is a vintage “Making-of” featurette. Paramount Home Media announced some long-lead TV-on-DVD selections this past week that will be available for fans to enjoy in late January and early February of next year. Arriving on Jan. 29 as a double disc, eight-episode set is the high school crime satire, American Vandal: Season One, starring Griffin Gluck (Private Practice, Back in the Game, Red Band Society) and Tyler Alvarez (Every Witch Way) as would-be documentary filmmakers out to prove the innocence of a fellow classmate charged with an obscene case of vandalism against 27 members of the faculty at their high school. The drama of high school life is laid bare in this mockumentary-style series created by Dan Perrault (The Screen Junkies Show) and Tony Yacenda. Every little thing that happens in the search for the truth — did Dylan Maxwell (Jimmy Tatro — 22 Jump Street, Boo! A Madea Halloween, Super Troopers 2) do it — is magnified ten-fold, which more or less makes every minute of the day a source for drama! 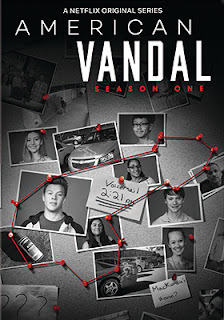 And that “drama” is played to the hilt in American Vandal (which was quickly renewed for a second season … and another crime of the century for the boys to investigate). 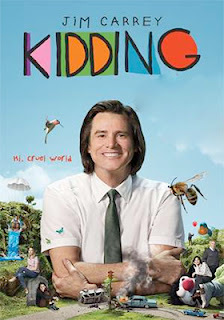 Also streeting on Jan. 29 is the Jim Carrey, Judy Greer and Frank Langella Showtime dramedy series, Kidding: Season One. This double-set features all ten episodes from producers Michel Gondry and Jim Carrey — who previously teamed for the 2004 theatrical release of Eternal Sunshine of the Spotless Mind (Gondry shared the Oscar with fellow screenwriters Charlie Kaufman and Pierre Bismuth in the Best Original Screenplay category). Jim Carrey plays public broadcasting mega-famous children’s star, Jeff Pickles of Mr. Pickles' Puppet Time, who is having an on-going crisis following the death of one of his children … it’s been a full year, but he can’t seem to move on. Paramount will also be promoting the DVD collection of The Game: The Complete Series on Jan. 29. It was difficult, because the role of Susan Bradley demanded that she was comfortable working with her 300 co-stars … full-grown tarantula spiders!!! VCI Entertainment announced this past week that director Chris Munger’s 1976 creepy horror tale, Kiss of the Tarantula, will be available as a Blu-ray/DVD Combo Pack for the first time on Jan. 22. The roll of the homicidal Susan went to newcomer Suzanna Ling, who would forsake a future in films for the stage. Filmed on location in Columbus, Georgia — where Munger made extensive use of the local talent — we are introduced to a young version of Susan (played by Rebecca Eddins), who learns that her mother (played by her real-life mother, Beverly Eddins) is going to send her off to boarding school because she feels that Susan’s father, John (Herman Wallner), loves her more than his double-dealing wife. Now Susan’s father is a mortician by trade, which makes Susan’s home life creepy enough. Add to that the nasty habit of Susan’s mother killing her pet spiders and you have all the makings of an unhinged little monster. So hearing that she is to be sent away, she does the only reasonable thing that little monsters would to do, she plants a deadly spider in her mom’s bed and does away with her! We now skip ahead to Susan’s teen years and without mom around, her pet spider kingdom has grown by leaps and bounds. Events will unfold that push her over the edge and, like Bruce Davison in Willard — who used his pet rats to deal with his tormentors — Susan uses her little friends to rid herself of those who cross her, especially those who would do harm to her eight-legged pets! Kiss of the Tarantula is a terrific skin-crawler from the 1970s — especially for the drive-in crowd — and now it will be available for genre fans to savor on Blu-ray for the first time. Bonus features include a newly-minted commentary by film historian David Del Valle (“Lost Horizons Beneath the Hollywood Sign”).